On the playground, most conflicts can be solved with a good ol’ fashioned game of Rock, Paper, Scissors (ro-sham-bo). Use this simple playground tool as a means to increase cooperation and communication as students are challenged to evolve from eggs to Superheros! 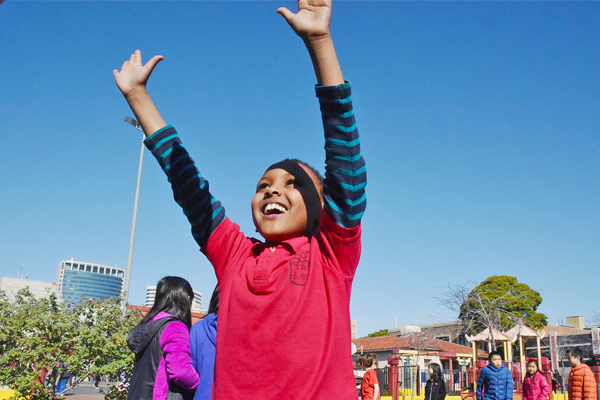 Can your students all become Super Heroes and fly high around the playground? To increase social comfort and to improve non-verbal communication. Have the whole group gather in a contained area. Establish an order for how players will morph through the game. For example, first could come the egg, then a superhero, then a dinosaur, then a rock star, then a chicken. Each stage has a corresponding action – egg is low to the ground with hands over their head, chicken walks like a chicken and clucks, the dinosaur has arms outstretched like big jaws, etc. Demonstrate clearly the different actions and the order, including what to do if you win or do not win Rock Paper Scissors (also called Ro Sham Bo). Remind players that they can only do Rock Paper Scissors with another player who is at the same stage, this encourages players to interact with many different people, not just their friends. Everyone begins as an egg. Players mix up, pair up and play Rock Paper Scissors (also called Ro Sham Bo). The person who wins morphs into another step, the person who did not win goes down a stage. If the player is already an egg s/he remains an egg. Players pair up again, only with someone who is in the same stage of morphing. When a player morphs all the way to the final stage, s/he is finished and can fly around the area. The game ends when all the players are also at the final stage or when the time limit is up. Allow players who lose Rock Paper Scissors to remain at their current stage. This makes the game go a little faster.